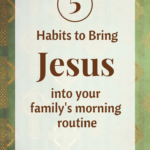 My kids are now 14, 12 and 10 years old, and I have cultivated a morning routine that centers on Jesus every day. Yes, some days are more hectic than others. However, as a rule, we have 5 morning habits that prevent stress and start our day with Jesus. This morning routine is a simple way to show my kids how to walk in victory with Jesus. 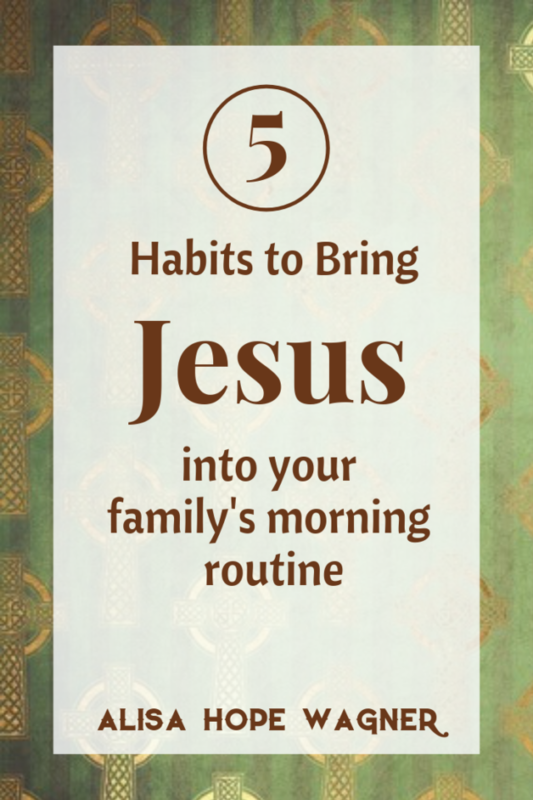 Establishing a family morning routine with Jesus will have lasting effect on my kids’ lives. My kids have been doing the same routine since they can remember. It has become a part of their lifestyle, which is exactly what I hoped for. I want these 5 habits to stick with them even when they leave the house. I want Jesus to be so apart of their day that it feels strange if they start their morning without Him. Why Starting the Day with Jesus is Important? First, I want my kids to know that they are not alone. My influence over their lives only goes so far. I am only human, and I can’t be everything to them at every moment. But God is everywhere always. He is all-powerful and all-encompassing. I want my kids to have the habit of trusting God. When they can’t rely on me, they can always rely on God. The Lord your God is with you, the Mighty Warrior who saves. He will take great delight in you; in his love he will no longer rebuke you, but will rejoice over you with singing” (Zephaniah 3.17 NIV). Second, I want my kids to know that they are loved. Jesus loves my kids so much that He would die for them. I need my kids to know this truth. I can’t expect them to love Jesus until they discover they are loved by Him. I want them to form a habit of carrying God’s love for them wherever they go. Once they recognize and feel His love, they can reciprocate it. For I am convinced that neither death nor life, neither angels nor demons, neither the present nor the future, nor any powers, neither height nor depth, nor anything else in all creation, will be able to separate us from the love of God that is in Christ Jesus our Lord” (Romans 8.38-39 NIV). Third, I want my kids to have the power of Christ in their day. Our world is both physical and spiritual. I want my kids to not only have physical healthy habits, but spiritual healthy habits also. They will need to develop a daily routine centered on Christ to live in His victory every day. The routine starts when they’re young and will continue as they grow in their relationship with Christ. For everyone born of God is victorious and overcomes the world; and this is the victory that has conquered and overcome the world—our [continuing, persistent] faith [in Jesus the Son of God]” (1 John 5.4 AMP). Family Morning Habit #1: I Encourage Myself in the Lord. I can’t expect my kids to start their day with Jesus if I don’t. The first habit I do every morning is to encourage myself in the Lord. I remind myself that I am loved and blessed. Then I scrape away every fear, doubt, anxiety and worry. My kids are sponges and they will soak up whatever atmosphere I create for them. No matter our family circumstances and what is facing our day, I do as King David did and strengthen myself in the Lord. …But David strengthened himself in the LORD his God” (1 Samuel 30.6 ESV). Family Morning Habit #2: Wake up on time. I know this is simple, but waking up on time will start the entire day with less stress. I make it a habit to wake my kids up an hour before we need to leave. This gives us plenty of time to ease into our day. Waking up on time is a habit that contributes to having a peaceful and joyful morning. Waking up early is a morning routine that will open the door to the other morning habits with Jesus. Let me hear Your loving kindness in the morning, For I trust in You. Teach me the way in which I should walk, For I lift up my soul to You” (Psalm 143.8 AMP). Family Morning Habit #3: Motivating Words and Touch. I personally go to each of my kids’ bedrooms and tell them something positive about the day to motivate them awake. I pet their heads and backs and tell them how handsome, beautiful, smart, talented and loved they all are. Also, I make a habit of giving them a little motivation for the day. I make it a routine to remind them of any special nugget that makes that day a gift. With God there is always something to look forward to! Because of the Lord’s great love we are not consumed, for his compassions never fail. They are new every morning; great is your faithfulness” (Lamentations 3.22-23 NIV). Family Morning Habit #4: Prayer during breakfast. The morning prayer in not simply a prayer of grace for our food. I have a routine of praying for my individual kids and their day. I pray that God leads them and blesses them. I pray that they are protected from evil. I acknowledge that God will be with them throughout the day. I want them to have a habit of recognizing God’s presence in their lives through prayer. Family Morning Habit #5: Daily Devotional or Scripture. We have read many family devotionals through the years. 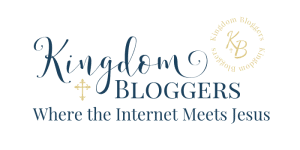 I started with simple devotionals for small children and toddlers. I have since moved up to devotionals for bigger kids. 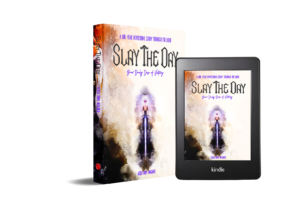 I even read the daily devotional I wrote, Slay the Day, to them. 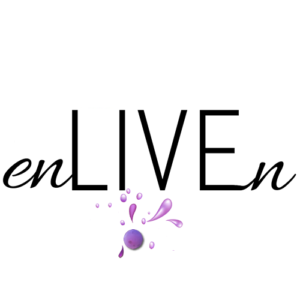 We make it a daily routine to read devotionals or several Scriptures from the Bible each morning. I read these words to them while they each their breakfast. Therefore, they will be not only physically and spiritually fed, but equipped for the day! “All Scripture is God-breathed and is useful for teaching, rebuking, correcting and training in righteousness, so that the servant of God may be thoroughly equipped for every good work” (2 Timothy 3.16-17 NIV).